ARMAND MARSEILLE DOLLS originate from Thuringia, Germany, and were made from 1885 to about 1950. The founder, by the same name, came to Germany from Russia around mid-19thC. He soon acquired the toy factory of Mathias Lambert in Sonneberg and in 1885 expanded further by acquiring the porcelain factory of Liebermann & Wegescher in Koppelsdorf. The company later merged with another porcelain dolls manufacturer, Ernst Heubach in 1919, to form the United Porcelain Factory of Koppelsdorf. However, the two companies split in 1932 and both continued operations on their own for a few decades more. Although a lot of production took place during the later part of 19thC, the vast majority of Armand Marseille dolls in the antiques market today were made between 1900 to 1930. It is very rare to find any Armand Marseille dolls that are unmarked and one should be very skeptical of such specimens. Almost all of their dolls were properly marked, but it is possible that some marks have either faded or are not easy to see. Practically all of these marks are incised or impressed, usually in a hand-written manner, and usually include the Model or Mold Number and/or size. At times, they also include the maker's marks of the company that produced the body they are attached to. To this point and as many collectors know, Armand Marseille produced only the head of these dolls, in Bisque. Most are in the form of a baby or young child and some are "lady" or "character dolls". Some had painted eyes, but most were made using glass eyes. The body was subcontracted to other companies and it was usually made of different material, including Cloth, Stuffed Kid or Composition. Therefore, strictly speaking, Armand Marseille made Dolls Heads and as such are nowadays regarded as one of the best brands by collectors and fetch high prices at Auction. Appraising Armand Marseille dolls is a bit tricky as a lot depends on condition and authenticity. Being essentially toys to be played with and in spite of the fact that most girls are more careful than boys their age, many have suffered severe damage, most often in the form of cracks or chips to the Bisque material. 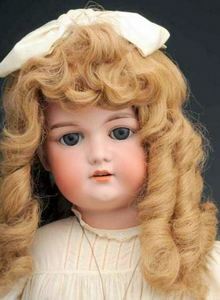 In these cases, professional restoration by someone experienced with antique dolls is the best course of action; DIY repairs are not recommended for prized collectible dolls such as these. In our experience, very few appear to be viciously mutilated, such as having their eyes or other features removed or destroyed, and it seems that they were almost always loved and cared for, but age-related wear happens and this is to be expected. In general, the larger the size and the rarer the Mold Number, the higher they appraise. Just for reference, the most common Mold Numbers are 370 and 390. The best way to appraise Armand Marseille dolls - or any other antique dolls for that matter - is to find "comparables", i.e. similar dolls that sold at auction and compare prices. You can see several such examples below on this page. These are from our Antiques Price Guides..
To properly and accurately identify marks on Armand Marseille dolls or any other Porcelain or Bisque antique doll or doll's head, you can use our Porcelain & Pottery Marks Guides. Armand Marseille doll, together with a Bergman doll. Two wirework dolls and a pair of Armand Marseille dolls. Lot of 2: Armand Marseille Dolls.